Andrew Murray (1828-1917) was a South-African Dutch Reformed leader and author of devotional writings. Born in Cape Town, South Africa, Murray became a noted missionary leader and was one of the chief promoters of the call to missions in South Africa. This led to the Dutch Reformed Church missions to blacks in the Transvaal and Malawi. Apart from his evangelistic tours in South Africa, he spoke at the Keswick and Northfield Conventions in 1895, making a great impression upon his British and American audiences. For his contribution to world missions he was given an honorary doctorate by the universities of Aberdeen (1898) and Cape of Good Hope (1907). Murray is best known today for his devotional writings, which place great emphasis on the need for a rich, personal devotional life. Many of his 240 publications explain in how he saw this devotion and its outworking in the life of the Christian. Several of his books have become devotional classics. Among these are Abide in Christ, Absolute Surrender, With Christ in the School of Prayer, The Spirit of Christ and Waiting on God. The Spirit of Christ, one of his best known works, explores the relationship between men and the Holy Spirit, and what role it plays in life and faith. 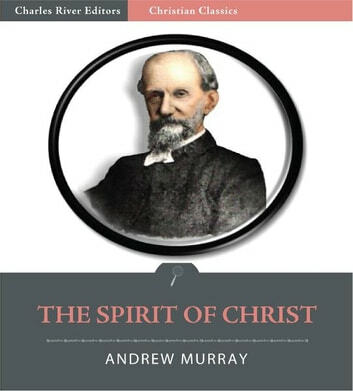 This edition of Murrays The Spirit of Christ is specially formatted with a Table of Contents and images of the great missionary.